What to look for when Hiring a Consultant to help you obtain an SBA Certification? 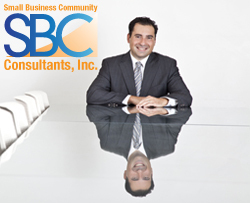 - SBC Consultants Inc.
We receive a lot of calls weekly with clients asking us questions about the process we use and the experience we possess, so they may make the best calculated decision in hiring the best consultant possible. a. What process do you use to get us certified? b. What kind of experience do you have in getting Businesses approved? c.Where did you learn how to do certifications? d.How successful have you been doing this? We recommend the consultant you hire be local to your business. This is crucial in optimizing efficiency in completing the certification. We do not recommend hiring a firm that is outside of driving distance from you. Some certifications will take between 20-40 hours to complete and the one on one time you get from a consultant is very important. A firm who is not able to meet with you one on one, will not be effective in completing the application for you. We have always made it a point to work with local companies, so that we can give them the best service and be most productive as possible. This is why we are so successful. Price does not determine the experience one possesses to effectively complete any certification. It really comes down to what the Return on Investment will be for you as a business owner. We recommend hiring a consultant that has the most experience and has the pedigree to complete the certification in a timely and effective manner. It is worth paying a little extra for someone who has the experience to finish the project in a timely manner. As CEO and President of Small Business Community Consultants, Inc. I have always made it a point to be involved with every client from beginning to end. Due to the hands on approach I have instilled within the company, we have not had one single complaint about the services we provide. This is largely due to the the experience I have attained directly from the Small Business Administration and the one on one time every client gets. We only work with companies who are local to us. There is no compromise when it comes to the customer service we strive to perfect for our clients. To learn more about our company please visit our website at www.sbclending.com/. To learn more about our certification services, please visit the certifications tab on the site.